Beat the scorching summer heat with a cup of wonderfully delicious, juicy watermelon chunks – a great source of much-needed water to quench thirst while re-boosting your body with anti-oxidant lycopene and vitamin-A. 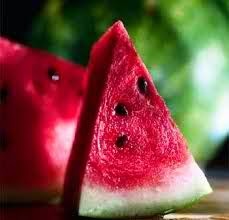 Watermelons are very low in calories (just 30 calories per 100 g) and fats yet very good source of potassium. Potassium is an important component of cell and body fluids that helps controlling heart rate and blood pressure; thus offering protection against stroke and coronary heart diseases (Rudrappa, 2014). Watermelon research is expanding due to health scientist’s interest in the citrulline content of watermelon. “Citrulline is an amino acid that is commonly converted by our kidneys and other organ systems into arginine (another amino acid). 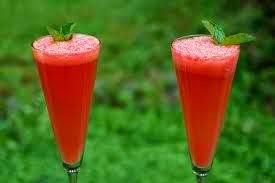 The flesh of a watermelon contains about 250 millligrams of citrulline per cup. When our body absorbs this citrulline, one of the steps it can take is conversion of citrulline into arginine. Higher levels of arginine can help improve blood flow and other aspects of our cardiovascular health” (The George Mateljan Foundation, 2014). Botanically, the fruit is related to the cantaloupe, squash and pumpkin. These family members grow as vines on the ground surface. The Guinness Book of World Records states that the heaviest watermelon weighed 262 pounds. To learn more interesting watermelon facts, check out www.watermelon.org. Smoothies are a great way to pack in vitamins, minerals and energy on the go!